Biography of Dutch Genre-Painter, Haarlem School. during the early 17th century. One of the more alcoholic Old Masters of 17th century Dutch painting, Brouwer lived the life of the stews and pothouses, and in them paradoxically finds the raw material for a very delicate art. What contemporary or later gossip tells about his short and disordered life suggests an odd blend of a roisterer and a cynic philosopher. He hated the social hypocrisies, perhaps also the social decencies, and made a point of showing them up. In the process he created some of the greatest genre paintings of the period. He was born at Oudenarde in Flanders about 1605, was early at Amsterdam, in 1626, became a fellow member with Frans Hals (1582-1666) in the Haarlem chamber of rhetoric called "Love above All." Earlier he must have been Hals' pupil, surely a close student of such pictures as the Merry Company. He was precocious - at twenty-one he was hailed as a master. For the five years between his initiation into "Love above All" and his registration in 1631 as a master in the painters' guild at Antwerp, we have little idea of his movements. But within a year of his settling at Antwerp we find him deep in debt, his entire property signed over to a friend to save it from hostile creditors. definition of art, see: What is Art? Still another year, and we find him a political prisoner in a Spanish castle. A contemporary writer says he was imprisoned for approaching the castle "dressed as a Hollander." However unlikely this seems, it indicates that Brouwer was suspected of Dutch and Protestant sympathies. It was not a harsh imprisonment, for Brouwer's expense account, met by a friend, for about six months was a massive five hundred gulden. In that highly organized Alsatia which great prisons then were - where a prisoner could freely enjoy any pleasures for which he could pay, the bankrupt painter was living at the modern rate of about fifty thousand dollars a year. Legend has it that Brouwer rejoiced in a sordid shabbiness of person and clothing, but he must, after all, have been reasonably housebroken or Rubens' staid engraver, Paulus Pontius, would hardly have taken him in as a boarder. Within a year, Pontius had to commute Brouwer's board bills, for pictures, in the presence of a magistrate. The etched portrait of Brouwer by Van Dyck, made probably in 1634, suggests a man of sensitiveness and dignity, even if he is described in the caption as pictor gryllorum, "painter of oddities." Brouwer had, with the defects, also the qualities of his Bohemianism - a ready wit, friendliness and generosity, a scorn of pretense and hypocrisy. He sold his little pictures at very high prices, and is said to have destroyed a picture before a haggling patron rather than reduce the price. He had reason for such pride, for Rubens bought no less than seventeen of his pictures, Rembrandt (1606-69), eight and a book of sketches. There could be no higher compliment to any draughtsman than to have his sketches desired by Rembrandt. Brouwer's brief, stormy and brilliant career was cut off abruptly towards the end of 1638, probably by the plague. He had just entered his thirty-third year. He lived on in local legend as a wag and boon companion. For other members of the Haarlem school, see the still life masters: Willem Claesz Heda (1594-1680) and Pieter Claesz (1597-1660). Brouwer's early fine art painting at Haarlem has been identified by painstaking connoisseurship. Its feeling is drastic, even brutal, rather painty, with the edgy sort of construction practiced by Peter Bruegel and his imitators. It is like Old Bruegel also in a tendency to caricature - squat proportions and incredibly bestial faces. In these early pictures, he tends to employ the greatest variety of local colour that the subject permits. This early, really juvenile, manner may be sufficiently represented by Drunken Peasants. He is unsparing in his emphasis of the ugliness of raucous intoxication. These figures are dehumanized, have ceased to be a company, are so many maudlin individuals. But the pictorial arrangement is as refined as the feeling is coarse. The scene is one Brouwer always loved - a basement tap-room with the light filtering in from above. The shadow at its deepest is aerial and transparent, never vague or dead. The compact group is admirably composed both in pattern and depth. The play of light and dark on faces and headdresses is most picturesque and expressive of form. The incidental still life is touched in with tenderness and strength, and unobtrusively enhances the character of the scene. The figure construction is large and simple. Paradoxically, the effect is at once lively and stable. We have drunkenness seen very specifically, but yet in a sort of eternal aspect. Within a few years Brouwer was to paint with greater finesse - indeed, this picture shows nothing of his later glorification of tavern life - but it does already give promise of a great master. Within an activity of only about a dozen years Brouwer's oil painting passes through the phases that usually imply a long career. With all the irregularities of his life, he must have studied incessantly, or perhaps he belonged to that happy race of artists who, as it were, without taking thought, experiment as they work. What we may call his second manner, between his leaving Haarlem and settling at Antwerp, was marked by a greater concentration in composition, a finer economy in the use of colours and pigment, a swifter and lighter handling of the brush. Since he did not date his pictures, it is fair to admit that these "periods" are inferences from the style of the pictures. Instead of the various colours of the Haarlem days we now find a single focal accent - the faded blue of a peasant's blouse, more rarely a faded rose. The rest of the picture is swept in with warm and translucent grays and browns, the whole effect more atmospheric. The solid and energetic construction of the figures is now effected through infinitesimals of light and dark - no longer heavy edges. Any of the seven or eight pictures of tavern fights or singsongs - Munich is rich in them - are sufficient to illustrate this new aspect of his genius. What is admirable in these examples of Protestant Reformation art, is the clarity and force with which the main theme is asserted - in the fights one listens for the crack of broken skulls. Admirable as well is the sense of place. These reeking basement rooms, with the hint up cellar stairs of better air outside, convey with an unsparing sense of the foulness of the scene also a sense of strange beauty, as if all the varieties of transparent dark and half-light had found a harmonious rallying ground. There is no mystery in Brouwer; everything is plainly stated and accounted for. The dusk rather enhances than veils or attenuates the drastic vigour of the action. What Brouwer seeks and achieves is a sort of transfiguration. The planless exuberance of revelry or drunkenness assumes a sort of demonic character - has some kinship with the divine intoxication of the Greeks or of Dr. Francois Rabelais. Treated from the point of view of human relations, drunkenness is simply revolting, and no subject for art. Isolated and unrelatedly, as Brouwer treats it, intoxication has its fascination and even its splendour. Brouwer's superiority is that he could both be one of his drunken protagonists and abstract himself until they became pure objects of observation and contemplation. As he sat in the pothouse his mood must have readily shifted from participation in its rowdiness to complete detachment. It was, of course, in such detachment that he made those wonderful drawings which Rembrandt coveted, and, of course, only a completely sobre man, in full command of his faculties, could have exercised the dark magic that inspires Brouwer's impeccable workmanship. In the last two or three years of his life the handling grows still lighter, the pigment still thinner and more translucent; colour yields further to tone. We have occasionally pictures nearly on the scale of life, character studies, caricatures, if you like, somewhat reminiscent of Frans Hals. Such are the Bitter Draught, and the Smoker. Singing Peasants and Soldiers playing Dice, are representative of this last phase, in which the old rowdiness is giving way to simple jollity. One of the best pictures of this time and type is Singing in the Kitchen. In the Quack Doctor Operating, Brouwer treats with racy satire and sympathy a subject to which Bosch and Bruegel had given a more sinister interpretation. It is plain that Brouwer was incapable either of condescension or of scorn. There is nothing of the moralist in his work. He loves the play activities of the human animal, and since the human animal of his day indulged play activities hardly at all except under the influence of alcohol, Brouwer simply accepts the fact and turns it to his artistic purpose. There were better moments when he deeply felt the purifying loveliness of nature, and he also produced some truly beautiful landscapes. For more about his contribution to art, see Flemish Painting. 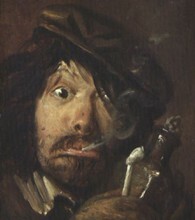 Adriaen Brouwer is yet another example of the apparent lack of connection between character and genius. The artist in him was exquisitely disciplined; the man always at loose ends. Again it seems as if the creative part of the man was a sort of second personality - a better self. Until psychology solves these paradoxes - and I much doubt if it ever will - we must be content to receive great art from whatever hands make and offer it, even if these hands are not clean. For another renowned Haarlem artist, see the architectural painter: Pieter Jansz Saenredam (1597-1665). For his vividness, delicacy, and taste in composition, Brouwer seems head and shoulders above the scores of excellent little Dutch masters who dealt with the themes of his genre-painting. His influence upon such masters as Adriaen van Ostade (1610-85), Jan Steen (1626-79), and even David Teniers the Younger (1610-90), was considerable, and he inspired a group of closer imitators who are too unimportant to be considered in a general survey. Whether as a craftsman, or conceptually, Brouwer is possibly the greatest painter of the lowness of low life that the world has seen. Works by Brouwer can be seen in the best art museums across Europe.  For biographies of great artists, see: Famous Painters.